Part 9 of The Journal Fodder Junkies Daily Challenge is now available! It contains 30 new challenges plus a whole new gallery of journal spreads. So check it out at the JFJ Shop. 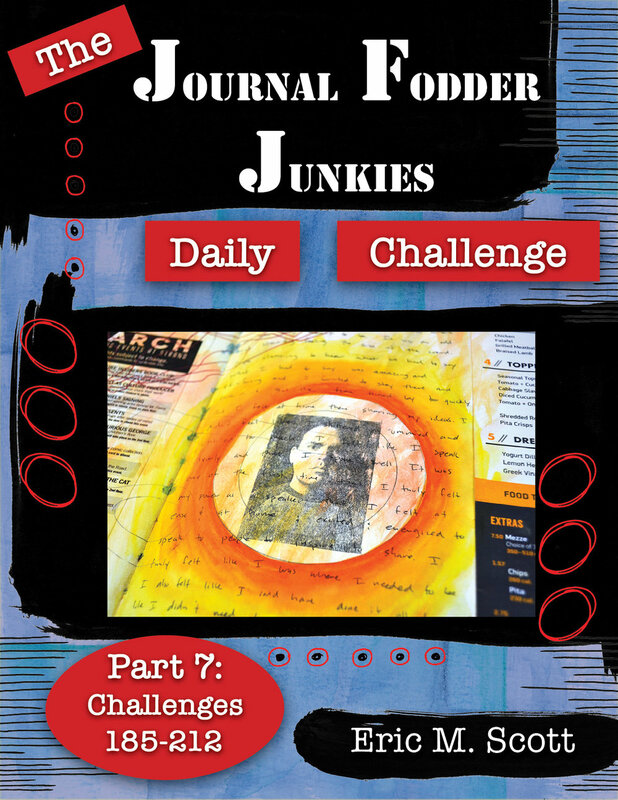 The Journal Fodder Junkies Daily Challenge: Part 8 Now Available! It's a couple of days late, but Part 8 is now in the Shop! Check it out for more daily creative inspiration! This new ebook in the series has 31 new challenges for the month of March, and is full of techniques, concepts, and ideas for your art work and visual journal. This week I focused on continuing to build layers in my journal, and began to add some embellishments as well as some cutouts to many of the pages. I often think of embellishments as decorative elements that I can add without much thought or bother, and during the week, I found myself doodling many of these embellishments while watching television using ink pens and paint markers. They often take a bit of time to add, so evening television watching is a perfect time. I also, spent some time cutting out some windows in multiple pages. These small rectangular cutouts give a glimpse of the page underneath and create a bit of interactivity to the journal. It's always interesting to see what glimpses are revealed in the widows. I spent time using watercolor pencil to add some layers as well. Besides working in the big journal, I decided to break open a new, smaller journal to try out something a bit different. I've been developing an idea for a new workshop that I'm hoping to teach in the near future, and I've been excited to try out some ideas. I've been thinking about how words, images, colors and materials can play out across and through pages - how one page relates to another - how ideas can figuratively and literally flow from one page to another. I'm excited to see how it turns out, and I'll share more about the workshop when I have more to share. Looking for a way to kickstart your artmaking for the new year? Did you make a resolution to make more art this year? Then the Journal Fodder Junkies Daily Challenge might be just the thing for you. This ebook series contains daily challenges to spark ideas and get you making art. The first ebook was published in August 2017, and a new part has been published each month there after. Part Six is now available. If you haven't taken advantage of this awesome series yet, the New Year is a perfect time. With six parts published now, there are enough challenges to get you through June. Check out the Shop for all six ebooks, and get creating in 2018! Today is the 365th day of the year — the last and final day of 2017. On January 1st I began a journey of daily challenges to help myself stay engaged with my art and my visual journal. The premise was simple — to make art and to work in my journal everyday focusing on a material, a technique, an idea, or a theme. Today is the last challenge — reflection. And I thought it would be good to reflect on the past year and all of those challenges not just in my journal, but also here, where I can share. Here are my reflections on this endeavor in no particular order. It was rather difficult to come up 365 different and unique challenges in the first place, and some of the challenges were very similar, or I used them in similar ways. That doesn’t negate those challenges, but there were times that I was like, “Wait! Didn’t I already do this?” It wasn’t a bad thing — just something that I noticed. I quickly discovered that it was very difficult for me to do a challenge each day. Life has a way of interceding, and I was also trying to document the challenges as I made them, which meant photographing and editing as I went. That definitely added to the difficulty. It worked much better for me to work weekly. I’d sit down some time during the week - often on Friday and spend a several hours working on the entire week of challenges. That was one of the main reasons for me to post the challenges every Friday. I could sit down in one big journal session, and crank out a week’s worth of challenges. I was very resistant to some of the challenges, and there were often times when I just didn’t want to do certain ones. But that was one of the main concepts of the challenge, to push me out of some of my normal ways of working and to challenge myself with new ideas and techniques. Though I was resistant, I am so glad that I pushed through and tackled each. I am glad that it pushed me out of my comfort zone. There were too many Big Ideas for my taste. In order to come up with 365 challenges, I used a lot of these big, human issues and concerns like identity, home, independence, and connection. Many of these ideas are ones that I’ve explore over and over in my journals throughout the years, but there were many more that I haven’t. All of these Big Ideas led to a word heavy feel in my books. Although writing and words are an important part of my journaling practice, it was just a bit too much. It was good to do it and to reflect on these ideas, but it went a bit against my natural way of thinking. I miss the big book! I started out the year working in an 11x14 inch Strathmore Hardbound Drawing Journal, and it quickly filled, so I decided to change things up a bit and switched to a 5.5x8.5 inch Stillman & Birn journal. Though I really like the paper and the size, there were many times I wish I had the expansiveness of the bigger journal. I think that I’ll start the New Year with a big book. I really enjoyed the observational drawing challenges. Over the past few years, I’ve gotten away from that type of drawing, and I’m hoping to incorporate more in the future. I was impressed with the volume of work produced. It would normally take me eight months to a year to fill a big book, but in the past 12 months, I’ve filled the big Strathmore book and two of the smaller Stillman & Birn books. Even though I layered ideas and challenges, and many pages contain remnants of 6 or 8 challenges, working consistently in the journal led to a lot of work. Keeping up with the challenges didn’t leave a lot of time to focus on other things in the journal. Though I did use it often for non-challenge stuff, spending a few hours each week working on very specific things did take a bit away from the natural flow of working in the journal. In some ways the challenge connected me to my journal, but in other ways it disconnected me from the natural organic nature of the journal. But overall, I really enjoyed the challenge. I enjoyed the consistency. I liked pushing myself out of my comfort zone, and I enjoyed revisiting ideas and techniques that I don’t use very much anymore. I’m hoping to take many of these ideas into the New Year. I hope that you enjoyed following along as much as I enjoyed doing it. Thank you for following along. It's the last couple of days of the year, and that means that the JFJ Daily Challenge is coming to an end. It's been a year of challenging myself, and it's a little bittersweet to see it end. But I have plans to keep challenging myself in 2018. Just one more full week in 2017, and the Daily Challenge is quickly coming to an end. Here's what I've been up to this week. I can't believe that the year is almost over, and that there's just over 2 weeks left. Here's what I've been up to this week with the Daily Challenge.